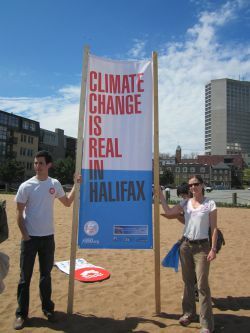 Citizens' Climate Lobby Halifax volunteers Graham Girard and Linda Davis at the 350.org event "Connect the Dots" Photo Credit: Chris Majka. As the province considers its carbon pricing options, a growing number of experts and pundits are conferring with the Finance and Community Services Departments’ policy directors pointing them to and calling for a revenue neutral carbon pollution dividend to every citizen. 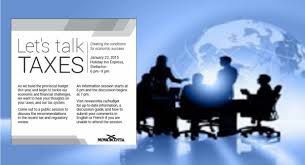 The government of Nova Scotia is in the midst of holding public input sessions called “Let’s Talk Taxes” posing three “taxing” questions to citizens, which citizens in small group sessions discuss and return their points to the finance department for compilation and consideration. The number two question asks if the province should introduce a price on carbon. At the Halifax session, a consistent “yes” to carbon pricing was tabulated from the groups’ chart paper notes displayed around the room. The Kyoto Protocol, which Canada signed in 1997, and ratified in 2002, committed Canadians to a collective obligation—reducing greenhouse gases (GHG) emissions to 6% below 1990 levels by 2008-2012. (The U.S. target of a 7% reduction was signed but never ratified.). Total GHG emissions by both nations have in fact increased substantially. But the majority of Americans and Canadians have seen little change in the real value of their consumption, which is now significantly more energy-efficient, per dollar of spending, than it was in 1990. Many Canadians and Americans have in fact therefore already reduced their own household production of greenhouse gases by as much, or more, than the Kyoto Protocol would require. This paper therefore asks: What individual obligations correspond to Canada’s collective commitment? Who has been responsible for the overall increase in Canada’s GHG emission? Who should now pay for reduced GHG concentrations? Osberg’s third argument in the paper: "that an escalating carbon tax which is fully refunded as a demo-grant to all citizens offers the best practical hope for efficient and equitable climate change policy." This provides a sound academic solution to back up Minister Whalen’s regularly issued statement during the sessions—that a price on pollution must not hurt the low income households. Dr. Osberg offers that a carbon fee with a demo-grant (dividend) is the best common sense answer. Carbon fee and dividend is a practical example of applying the principle Gifford outlines. It places a steadily-rising fee on the carbon dioxide content of fossil fuels at the well, mine or port of entry. The fee increases steadily each year with the intention of making clean energy cheaper than fossil fuels within a decade. The revenue from that fee is returned to households in equal shares in the form of a dividend cheque. Under this plan 66% percent of Canadian households would break even or receive more in their dividend cheque than they would pay for the increased cost of energy, thereby protecting the poor and middle class from the impacts of the rising fee. A predictably increasing carbon price will send a clear market signal which will unleash investments in the new clean-energy economy. A study from Regional Economic Models, Inc. (REMI) – released last summer by Citizens’ Climate Lobby – looked at the impact of a fee starting at $10 per tonne of CO2 that rose $10 per tonne each year in the United States. In the study, all the revenue from the fee was divided equally among all households and returned as monthly payments. After 20 years, CO2 emissions were cut in half and 2.8 million jobs were added to the American economy. The job growth comes primarily from the stimulus effect of recycling carbon fee revenue into the pockets of people who are likely to spend the money. Carbon fee and dividend is sometimes called carbon tax and dividend. “But lower and middle income Canadians have seen their real incomes stagnate for several decades now. They feel increasingly pressured financially and they are understandably mistrustful of promises that a new tax, which visibly adds to their day-to-day cost of living will be somehow offset by invisible benefits sometime in the future. Unless there is a clear way of counteracting the argument, a carbon tax proposal will always be vulnerable to the Harper government’s message that it is an attack on “the hard working Canadian middle class”. The CTD proposal is a straightforward way of showing this is wrong--the CTD would improve both environmental sustainability and economic fairness." Economists and political pundits from either side of the political spectrum have also announced their preference for a revenue neutral carbon pricing system including Preston Manning, a member of the new Canadian Ecofiscal Commission, Dr. David Robinson, Director of Director of the Institute for Northern Ontario Research and Development and Green Party candidate, and Jeff Rubin, economist and author. Recently, Nicholas Rivers, Chairholder, Canada Research Chair in Climate and Energy Policy, released a paper called The case for a carbon tax in Canada, outlining how carbon taxes are effective, efficient, easy to design and transparent, and even popular with the public. The N.S. Department of Community Services is also studying carbon fee and dividend after CCL volunteers introduced the plan to Brenda Murray, their policy director. An integration of these two department’s tax application was also a recommendation in The Broten Report. 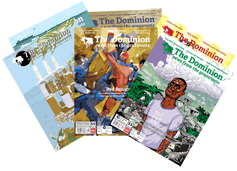 “If we recognize that it is consumption which ultimately drives GHG emissions, who then is really responsible for the increase in global concentrations of greenhouse gases…the poor and the middle class Canadians and Americans of 1990 are not the people who have been responsible for the rising consumption that drives increased global concentrations of greenhouse gases. Nevertheless, under some proposals, the cost of policies to reduce greenhouse gas concentrations will be borne disproportionately by the less well off…” The volunteers were able to reassure the minister that the carbon fee and dividend would do better than that—take a small bite out of poverty. CCL Volunteers are meeting with policy directors this month. The Nova Scotia Business Inc. website states that Nova Scotia has legislated targets for 25% renewable electricity by 2015 and a goal for 40% renewable electricity by 2020. The website summarizes the potential in various clean energy technologies and lists businesses operating now in some of these areas. As Nova Scotia’s clean technology industry attracts considerable international attention, its accessibility to natural resources, such as wind, tidal and solar, enables the province to engage in significant research and development activities as well as large scale projects. According to Analytica Advisors, Canada’s clean technology sector, currently an $11.3 billion industry, has the potential to grow to $50 billion by 2022 and represent two percent of the global market share. Clean technology could transform Canadian industrial practices if the Canadian and provincial governments legislates policies that optimize its growth. Other countries have taken notice, buying environmentally-friendly Canadian technologies that help reduce and recycle solid waste, improve efficiencies and reduce our reliance on fossil fuel and petro-products. Approximately 74 percent of Canadian clean technology companies are exporters, with 42 percent of export sales going to non-US countries. Without domestic support, Canadian clean technology companies are in danger of being bought out by international players, taking Canadian innovation and jobs with them. While Canadian clean technology enjoys strong market diversification overseas, it struggles to compete domestically. One challenge is the price of carbon-based energy, which is relatively cheap in Canada compared to many countries. A fee on carbon that rises annually will send a market signal to invest in technologies that help reduce carbon emissions and clean up the environment. Between 2008, when BC legislated a revenue neutral carbon tax, and 2010, the province’s clean technology sector’s sales grew by 48 percent. In 2012, BC was home to 22 percent of clean technology companies in Canada. It would be wise for Nova Scotia to look beyond the British Columbia made-in-Canada solution to pricing carbon. If Nova Scotia implemented a superior Carbon Fee and Dividend, similar results would occur, perhaps even more so because the cost of living in Nova Scotia is less than in B.C. While Stephane Dion’s failed Carbon Shift is often cited as a reason for politicians to avoid carbon taxes, the temperature is changing regarding public acceptance. BC’s former premier, Gordon Campbell was re-elected following the introduction of the province’s carbon tax, which has enjoyed strong support from British Columbians according to polls. The most recent poll, from Abacus Data, shows that 69 percent of Canadians feel that Canada should introduce a policy that provides a financial incentive to reduce carbon emissions over time. Fifty-nine percent would like to see increased taxes on activities and products that produce higher emissions, while 78 percent support lower taxes on activities and products that produce lower emissions. “Here’s your cheque!” Carbon Fee and Dividend offers Nova Scotia a solution that supports and will foster public acceptance of a carbon tax through the rising fee on fossil fuels and money returned to households through dividend cheques. Nova Scotia will also benefit from a growing clean technology sector that offers high quality jobs, stimulated by the rising fee on fossil fuels.